5 years is a long time. 5 years ago I had just graduated from college and gone on a trip to Europe: I was broke. It wasn’t a great time for jobs, so I was working part time and sharing a 1-bedroom apartment with 2 other girls (my “bedroom” was actually the dining room and my “door” was a curtain). 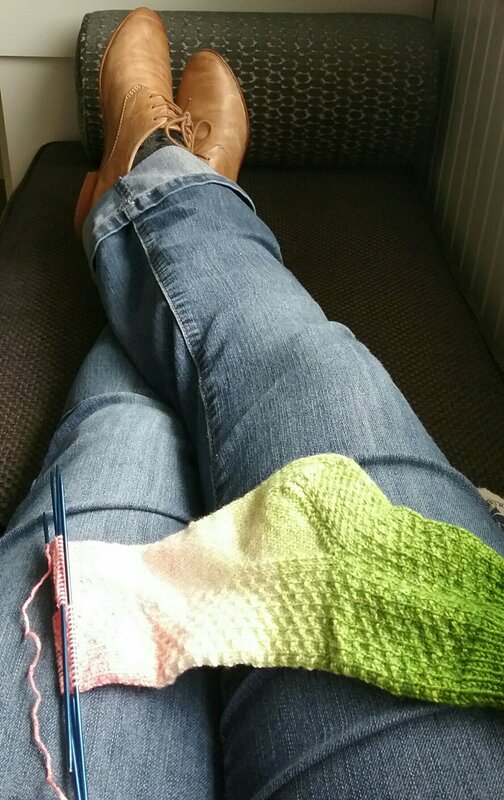 I was a new knitter, so I barely knew what I was doing and had no idea what good yarn was. But I was passionate about knitting, so I made do with what I had and somehow not everything I knit during that period was crap. I had found Ravelry by this time and I adored Tin Can Knits (I still adore them. They’re fabulous!). It was Christmas time, so I bought their Sitka Spruce hat pattern and some KnitPicks yarn (Wool of the Andes Superwash) and began to knit (note that I did not swatch). 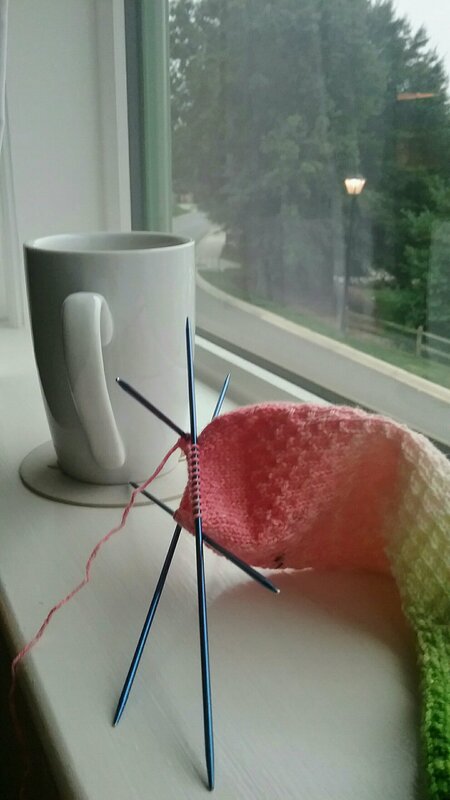 I had trouble with the pattern – not because it wasn’t a good pattern (Tin Can Knits patterns are awesome), but because I was a new knitter and I was still figuring the whole knitting thing out. By hook or by crook I finished the hat and then realized it was too big. It probably would have fit a giant perfectly. I stuck it in the washer and dryer and hoped it would shrink some…no dice. So I threw it in the bottom of my stash and started something else. I was really sad though. I had spent so much time (and a decent amount of money to me at the time) on this hat, only to have it not fit. I knew it was my fault because I wouldn’t take the time to swatch…but it still hurt, and from time to time it niggled at my brain. I did a few google searches and found out that I could sew elastic thread inside the brim to tighten it up, so I bought some elastic thread and set to with gusto. I got halfway through hat surgery and tried it on to see how I was doing, only to find that now my beautiful hat was too small. The Horror! The Irony! The knitting goddess was really trying to beat this lesson into me: For the love of wool, swatch before you start! (For the record, I swatch pretty religiously now. I still dislike it.) I threw the hat and elastic back in the stash and there it has stayed for the last 4 1/2 years. Today I pulled the hat out and found the elastic, determined to fix the darn hat once and for all. First I loosened the elastic I had already sewn in, then I sewed elastic into the rest of the brim. 30 minutes was all it took. Why did it take me 5 years to do 30 minutes’ work? 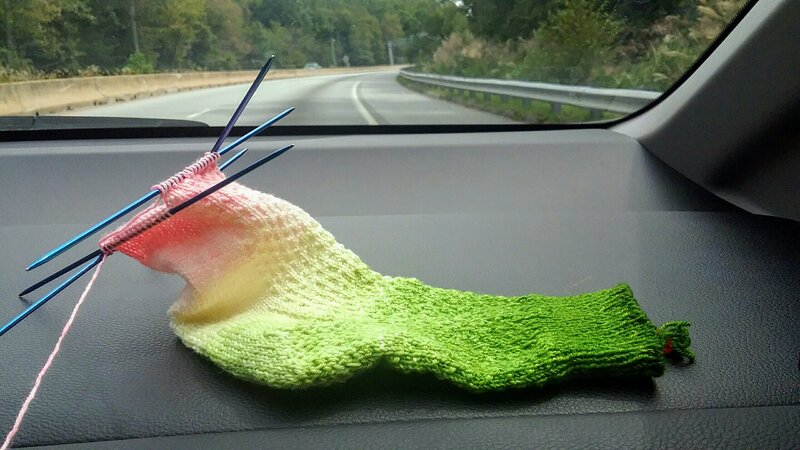 Next time I need to amend my knitting remind me of the 5 year hat. 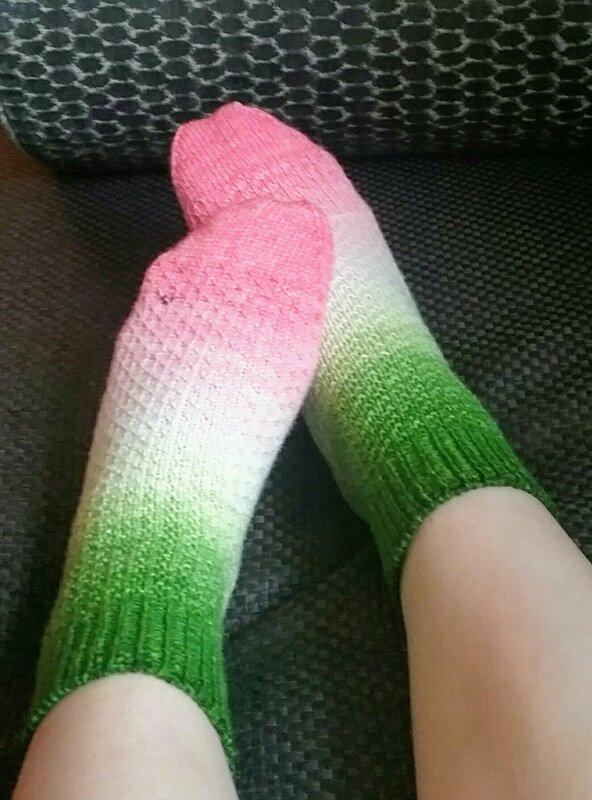 Posted on September 12, 2017 September 12, 2017 Categories KnittingTags finished object, knitting, Socks, watermelon socks2 Comments on I Finished the Socks! Will you just look at my finished cowl! It’s gorgeous! I used True Brit from Cathy Carron’s book Cowlgirls as a template, but really this cowl is nothing like the original pattern. 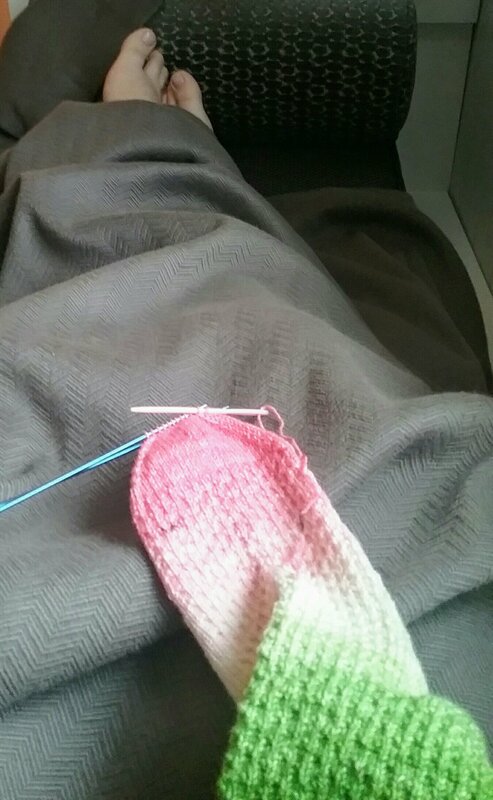 Do you ever do that thing where you look at a pattern and you like it except for this, that, and the other thing, and by the time you’ve finished knitting it, it is a completely different object than the designer intended? I like my version much better. Unfortunately I can’t keep it. It is a gift for a friend. The collar is just big enough to be worn flipped up or down for more or less warmth. I realized right after I bound off that I picked up stitches for the cowl on the wrong side of the blue section, so my beautiful seaming that I was so proud of is stuck inside the cowl. Oh well. Maybe next time I will remember to look first! It’s still beautiful, though, and I love it. And no one but me (and you) will know it was a mistake. You will keep my secret, right? Posted on September 6, 2017 Categories KnittingTags cowl, cowlgirls, finished objectLeave a comment on Complete! Next time I’m in the middle of 5 large projects with no end in sight remind me of the week I finished ALL THE THINGS! Also, remind me to spin a few Rainbow Rolls because those things spin up FAST! A month or two ago I bought two Rainbow Rolls because they were on sale and I was curious. A Rainbow Roll is a roll of predrafted, unspun fiber. It’s 2″ thick and about the size of a dinner plate. After I finished my Rumplestiltskin yarn I needed a palate cleanser, and this seemed like a quick spin. I had no idea how quick it would be though. Here’s what I had after an hour. The next day I finished spinning my singles (2 1/2 bobbins worth). I plied the yarn (first time plying from 2 separate bobbins! Woohoo! ), and now I have 3 beautiful skeins! It’s like a magic trick! Tadah! Posted on May 15, 2017 May 13, 2017 Categories spinningTags finished object, noro, rainbow roll, spinning, yarn2 Comments on Fastest Spin Ever!